KBO is located overlooking a former sand mine. 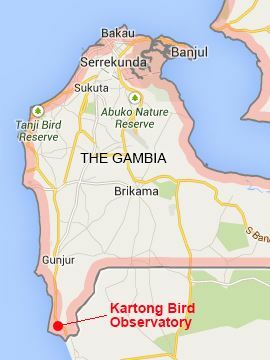 Since mining stopped these areas have filled with water during each rainy season and created one of the best birding sites along the coast of The Gambia. Bird ringing began at Kartong in 1996 with the pioneering work of Mike King and John High. To carry this work forward a team of ringers from the UK established a permanent ringing station at Kartong in 2010. Many of these species have been caught in large numbers allowing us to develop new ageing and sexing criteria for an avifauna that is understudied. We have caught many migrants from the Palearctic and hope to increase our knowledge of their migration patterns through West Africa and beyond. We run regular ringing courses for bird ringers from the UK. Each ringing course sponsors a number of Gambian students to gain valuable work experience learning the skills of bird ringing. To date 357 species of bird have been recorded at Kartong. Study bird populations and migration. Carry out bird ringing and other appropriate techniques to provide data on local bird communities. Improve public awareness and understanding of the environmental and economic benefits of biodiversity conservation. Provide data to The Gambian Department of Parks and Wildlife Management (DPWM) and other conservation organisations. Liaise with NGOs, bird ringers, naturalists, and bird watchers to help protect Kartong Wetlands. To provide educational resources demonstrations and training opportunities to build research capacity in The Gambia. Record all fauna and flora occurring at Kartong.